(Nanowerk News) Can you imagine fully charging your cell phone in just a few seconds? Researchers in Drexel University's College of Engineering can, and they took a big step toward making it a reality with their recent work unveiling of a new battery electrode design in the journal Nature Energy ("Ultra-high-rate pseudocapacitive energy storage in two-dimensional transition metal carbides"). The team, led by Yury Gogotsi, PhD, Distinguished University and Bach professor in Drexel's College of Engineering, in the Department of Materials Science and Engineering, created the new electrode designs from a highly conductive, two-dimensional material called MXene. Their design could make energy storage devices like batteries, viewed as the plodding tanker truck of energy storage technology, just as fast as the speedy supercapacitors that are used to provide energy in a pinch -- often as a battery back-up or to provide quick bursts of energy for things like camera flashes. "This paper refutes the widely accepted dogma that chemical charge storage, used in batteries and pseudocapacitors, is always much slower than physical storage used in electrical double-layer capacitors, also known as supercapacitors," Gogotsi said. 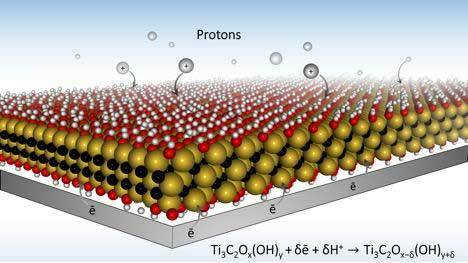 "We demonstrate charging of thin MXene electrodes in tens of milliseconds. This is enabled by very high electronic conductivity of MXene. This paves the way to development of ultrafast energy storage devices than can be charged and discharged within seconds, but store much more energy than conventional supercapacitors." The key to faster charging energy storage devices is in the electrode design. Electrodes are essential components of batteries, through which energy is stored during charging and from which it is disbursed to power our devices. So the ideal design for these components would be one that allows them to be quickly charged and store more energy. To store more energy, the materials should have places to put it. Electrode materials in batteries offer ports for charge to be stored. In electrochemistry, these ports, called "redox active sites" are the places that hold an electrical charge when each ion is delivered. So if the electrode material has more ports, it can store more energy -- which equates to a battery with more "juice." Collaborators Patrice Simon, PhD, and Zifeng Lin, from Université Paul Sabatier in France, produced a hydrogel electrode design with more redox active sites, which allows it to store as much charge for its volume as a battery. This measure of capacity, termed "volumetric performance," is an important metric for judging the utility of any energy storage device. To make those plentiful hydrogel electrode ports even more attractive to ion traffic, the Drexel-led team, including researchers Maria Lukatskaya, PhD, Sankalp Kota, a graduate student in Drexel's MAX/MXene Research Group led by Michel Barsoum, PhD, distinguished professor in the College of Engineering; and Mengquiang Zhao, PhD, designed electrode architectures with open macroporosity -- many small openings -- to make each redox active sites in the MXene material readily accessible to ions. "In traditional batteries and supercapacitors, ions have a tortuous path toward charge storage ports, which not only slows down everything, but it also creates a situation where very few ions actually reach their destination at fast charging rates," said Lukatskaya, the first author on the paper, who conducted the research as part of the A.J. Drexel Nanomaterials Institute. "The ideal electrode architecture would be something like ions moving to the ports via multi-lane, high-speed 'highways,' instead of taking single-lane roads. Our macroporous electrode design achieves this goal, which allows for rapid charging -- on the order of a few seconds or less." Use in battery electrodes is just the latest in a series of developments with the MXene material that was discovered by researchers in Drexel's Department of Materials Science and Engineering in 2011. Since then, researchers have been testing them in a variety of applications from energy storage to electromagnetic radiation shielding, and water filtering. This latest development is significant in particular because it addresses one of the primary problems hindering the expansion of the electric vehicle market and that has been lurking on the horizon for mobile devices. "If we start using low-dimensional and electronically conducting materials as battery electrodes, we can make batteries working much, much faster than today," Gogotsi said. "Eventually, appreciation of this fact will lead us to car, laptop and cell-phone batteries capable of charging at much higher rates -- seconds or minutes rather than hours."